(Nanowerk News) A clever materials science technique that uses a silicon crystal as a sort of nanoscale vise to squeeze another crystal into a more useful shape may launch a new class of electronic devices that remember their last state even after power is turned off. Computers that could switch on instantly without the time-consuming process of “booting” an operating system is just one of the possibilities, according to a new paper by a team of researchers spanning four universities, two federal laboratories and three corporate labs ("A Ferroelectric Oxide Made Directly on Silicon"). Almost exactly two years ago, a team led by Joseph Woicik of NIST and several other federal, academic and industrial laboratories combined precision X-ray spectroscopy data from the NIST beamlines at the National Synchrotron Light Source with theoretical calculations to demonstrate that by carefully layering a thin film of strontium titanate onto a pure silicon crystal, they could distort the titanium compound into something it normally wasn’t—a so-called “ferroelectric” compound that might serve as a fast, efficient medium for data storage ("Ferroelectric distortion in SrTiO3 thin films on Si (001) by x-ray absorption fine structure spectroscopy: Experiment and first-principles calculations"). The new paper adds a key experimental and technological demonstration—the ability to write, read, store and erase patterned bits of data in the strontium titanate film. In contrast to a traditional data storage material, which records data as a pattern of magnetic regions pointing in different directions, a ferroelectric can do the same with tiny regions of polarized electric charges. Ferroelectric memories are used, for example, in “smart cards” for subway systems. Ferroelectric structures that could be built directly onto silicon crystals, the most common materials base for consumer electronics, have been sought for years for a variety of applications, including nonvolatile memory (data that is not lost when power is turned off) and temperature or pressure sensors integrated into silicon-based microelectronics. One of the potentially biggest prizes would be ferroelectric transistors that could retain their logic state (“on” or “off”) without power, which could enable computers that switch on instantly without needing a boot stage. The breakthrough originated with researcher Hao Li of Motorola, Inc., who succeeded in depositing the metal oxide directly onto silicon with no intervening layer of silicon oxide producing “coherency” between the two crystal structures—the unique matching up perfectly of one atom to the next across the metal-oxide/Si interface. This is a difficult trick both because silicon is highly reactive to oxidation and because the crystal spacing of the two materials does not normally match. Guided by precision X-ray diffraction data from NIST, Li developed a finely controlled method of depositing the strontium titanate in stages, gradually building up layers that were only a few molecules thick. The result, X-ray data showed, was that the silicon atoms literally squeezed the cubic strontium-titanate crystal to make it fit, distorting it into an oblong shape. That distortion creates a structural instability in the film that makes the compound a ferroelectric. 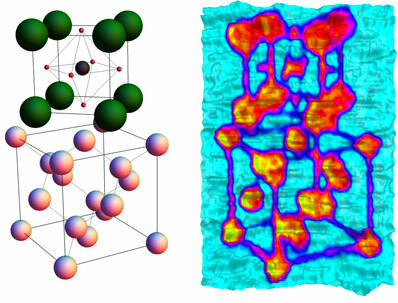 While theoretical calculations and spectroscopic data demonstrated that the distorted crystal behaved like a ferroelectric, proof of the ferroelectric functionality waited on the new work led by Cornell University professor Darrell Schlom, whose team used a technique called piezoresponse force microscopy to write, read and erase polarized domains in the strontium titanate film. Researchers from Cornell, the University of Pittsburgh, NIST, Pennsylvania State University, Northwestern University, Motorola, the Energy Department’s Ames Laboratory, Intel Corporation, and Tricorn Tech contributed to the latest paper. X-ray diffraction data were taken at the Advanced Photon Source, Argonne National Laboratory. The research was funded in part by the Office of Naval Research and the National Science Foundation.